In an unprecedented move, Army Chief General VK Singh today dragged the government to the Supreme Court, challenging its decision over his date of birth. If the government has its way, the General will retire on May 31. 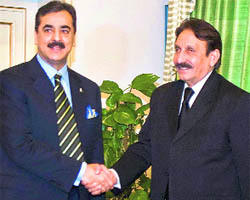 At loggerheads: A file photo of Pakistan PM Yousuf Raza Gilani with Chief Justice Iftikhar Muhammed Chaudhry. laundering case against President Asif Ali Zardari in a Swiss court. The battlelines for the January 30 Punjab elections were drawn today with 974 candidates, nearly half of the 2,054 who had filed their nominations, withdrawing from the contest. In all, 1,080 candidates will try their luck in the poll. Most of the 117 Assembly segments will see a multi-corner contest, with many rebels giving official nominees of the party a tough contest. Students attending higher education institutions run by the Centre and recognised by academic regulators will now have a platform to register their grievances and seek redress. Google India, which along with 20 websites is facing criminal cases for allegedly hosting objectionable materials, today told the Delhi High Court that blocking them was not an option as democratic India was not a "totalitarian" regime like China. SPORTS: The worst Indian team ever? 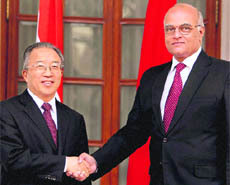 Amid hopes of an improvement in bilateral ties, the Special Representatives (SRs) of India and China today began the 15th round of talks on the long-standing border dispute between the two countries. 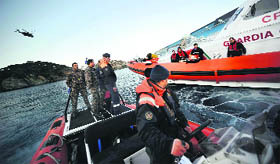 One Indian is missing in a luxury cruiser drowning incident off the Tuscan coast in Italy while 201 crew members from the country have been rescued, officials said here today.